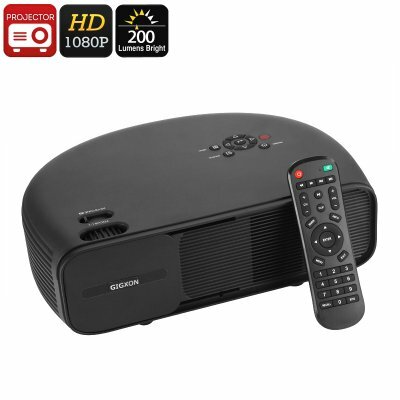 Successfully Added G760 Home Theater HD Projector - 1080p Support, 200 Lumen, 150-Inch Image Size, 2W Speaker, VGA, HDMI, USB to your Shopping Cart. The G760 Home Theater Projector allows you to throw stunning movie nights for all your friends. This powerful HD projector truly turns any dark room into your own cinema. It comes with VGA and HDMI inputs thanks to which you can easily connect it to your PC, Laptop, or TV set. Additionally, it supports USB input that lets you watch media straight from your memory stick. By supporting both wide-screen 16:9 and traditional 4:3 aspect ratios, this HD projector lets you watch any media without experiencing a loss in quality. This powerful LED projector is capable of producing up to 200 Lumens. Thanks to this, it produces clear and detailed images in vivid color. Its LED light is of high-quality and features a life of 50,000 hours. Therefore, you’ll be able to use this beauty for years to come. Whether you use it to watch movies or give presentations – this HD projector is sure to meet your demands. By supporting 1080p media files, your projector lets you enjoy the latest films and series. The native resolution is 800p, meaning that you’ll be treated to crisp HD visuals. With a projection size of 50 to 150 inch, this HD projector truly treats you to a cinematic experience from home. It has a throw distance of 1 to 5 meters, making it perfect for small and medium sized rooms and office spaces. If you are looking for the ultimate projector that lets you enjoy movies with friends and family like never before – the G760 Home Theater Projector is perfect for you. The G760 Home Theater Projector comes with a 12 months warranty, brought to you by the leader in electronic devices as well as wholesale HD Projectors..